FC Británico de Madrid – English speaking football in Madrid since 1972. 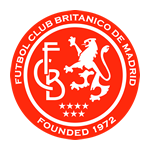 Welcome to the home page of FC Británico de Madrid, the number 1 English speaking football club in Madrid since 1972. We have players from all over the world who come together to play football but speaking in English. All team talks, training and matches are in English and we have players with all different levels of English. Over the years, we can boast players from over 50 different countries. It’s not just about what happens on the football field, it’s also about what happens off it and we regularly hold social events including an end of season tour. The social side is as important as the football side!